The Pratt Institute and Art Center College of Design enabled Rey Isip to gain professional experience as an industrial designer at Ford Motor Company, Chrysler Corporation, and W.B Ford Associates in Detroit, and Raymond Loewy Associates in Paris. After a short stint in design consulting with automobile companies in Japan and 15 years as a partner of his Graphics, Product and Environmental Design Company in New York, designing for many Fortune 500 companies, Rey turned to painting as a more personal expression of his creativity. 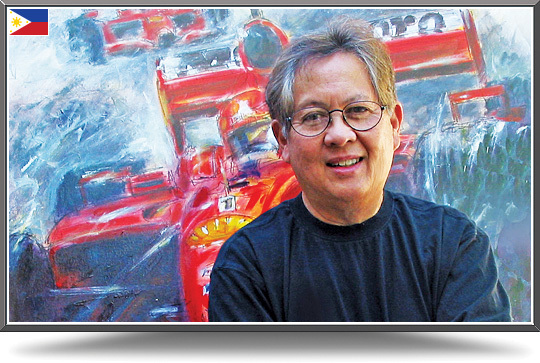 His continuing love for painting automobiles parallels his new work in abstracts and contemporary images, which are expressed with similar energetic line and brush strokes, color layers, and textures. Rey’s work can be seen in galleries in California, New Mexico and Arizona. Commission Rey to create a unique painting for you!